Metal fabrication covers a wide range of activities – from general welding to specialized laser job shops. Large and small fabricators need to support constantly changing workflows. Complexity increases as workflows combine both traditional and new cutting, welding and coating processes. Specific industries and application have specific issues. In the oil and gas industry, you need to address the harsh field conditions that can accelerate corrosion of your welding and cutting equipment which can pose risks to your people. In modern steel construction, your productivity will depend on how well your welding and cutting tools help you meet short production times, minimize deformation, maintain excellent small-hole quality and mark assembly lines. And, when cutting thin sheet steel, you need a high level of precision, flexible settings and optimum acceleration. You can improve workflows in many ways such as enhancing deposition rates, reducing spatter, increasing arc stability, reducing fumes, and enhancing weld-beads. For all workflows, you’ll need the right gas, and the supporting equipment and materials. WestAir's team of trained specialists will help you choose the right gases, equipment and delivery systems for your particular metal fabrication, welding and cutting applications. You have many different ways to weld: Gas Metal Arc Welding, Flux Coated Arc Welding, Tungsten Inert Gas and Metal Inert Gas. Some methods involve a wire fed "gun" that feeds wire at an adjustable speed and sprays a shielding gas (generally pure CO2, or a mix of Argon and CO2) over the weld puddle to protect it from the outside world. In all welding methods, your productivity and effectiveness depends heavily on the gases you use and supply systems that deliver them. Gas Metal Arc Welding: GMAW (also known as Metal Inert Gas: MIG) uses an automatic feeding of a continuous solid consumable electrode along with an externally supplied shielding gas. Fabricators use GMAW on most commercial metals including steel, aluminum, stainless steel and copper. GMAW equipment can include automatic arc control so that the welder can focus on gun positioning, guiding and travel speed. Flux-cored Arc Welding: FCAW uses an electric arc to coalesce, liquify, a tubular filler metal electrode and a base metal. You can achieve coalescence with or without a shield gas. Fabricators typically use FCAW for carbon steel, stainless steel and low-alloy steels. Gas Tungsten Arc Welding: GTAW (also known as Tungsten Inert Gas: TIG) liquefies metals by heating them with an electric arc formed between a tungsten electrode and the base metal. You may, or may not, use filler metal. You get gas shielding from your welding torch. 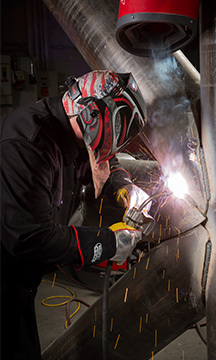 GTAW/TIG produces the highest quality welds of any open-arc welding process. You can use GTAW/TIG in all welding positions, but you’ll probably need a highly skilled operator, especially on thin and intricate parts. The aerospace & aircraft, energy, chemicals and oil & gas industries use GTAW/TIG extensively. Plasma Arc Welding: PAW uses a restricted arc that squeezes through a copper nozzle to create a longer, narrower and focused arc. The squeezing process increases arc voltage and the amount of ionization that takes place. The concentrated heat source increases the heat transfer efficiency, allowing faster travel speeds. You typically need a highly-skilled craftsmen when using PAW manually. Laser Beam Welding: LBW uses the heat from a concentrated beam of light to join two materials. You can use LBW to weld all commercial metals including steel, stainless steel, aluminum, titanium, nickel and copper. LBW delivers high mechanical properties and travel speeds, with low distortion and no slag or spatter. Welds may be fabricated with or without filler metal. In many applications, you may use a shielding gas to protect the molten pool. LBW equipment requires a significant capital investment and a highly-skilled craftsmen because of the high welding speeds and the small area affected by the laser beam. Shield Metal Arc Welding: SMAW (also known as Stick Welding) uses an electric arc created between the tip of a flux-covered electrode and the surface of the base metal. The electrode consists of a solid metal core coated by a mixture of mineral and metallic compounds. The type of the coating depends on the type of electrode and the welding polarity. The coating shields the weld pool and provides a fluxing-action to remove impurities from the weld deposit. Submerged Arc Welding: SMAW heats metals with an electric arc created between a bare electrode and the base metal. A blanket of flux material typically sits between the electrode and the base metal. The flux stabilizes the arc during welding and shields the molten pool from the atmosphere. Fabricators use SMAW for joining most metals and alloys. Most fabricators automate SAW workflows. Tandem Welding uses two in-line wires. Independent contact-tips, mounted in the same torch, feed and melt the welding wires. This results in excellent weld-quality, with little spatter and up to three times the deposition rates and travel speeds of conventional systems. Tandem welding fits well in automated applications. You need high-performance and industry-standard gases for high-quality welding and cutting production, no matter how demanding the application. You also need shielding gases that exceed the requirements of all relevant gas quality and mix accuracy standards. You have many cutting technologies to choose from. From oxy-fuel to plasma arc to laser cutting, your gases and supply systems play key roles in your productivity and effectiveness. Plasma Arc Cutting (PAC) cuts metal by melting a localized area of the material with a constricted electric arc and removing the molten material with a high-velocity jet of hot ionized gas. Precision plasma can produce laser-like quality cuts in some applications for significantly lower equipment and operating costs. Use the PAC process on most electrically conductive metals. Oxy-fuel Cutting gives you a cost-effective method of plate-edge preparation for bevel and groove welding. Moderately-skilled craftsmen can easily cut rusty and scaled plates. The oxy-fuel gas cutting process creates a chemical reaction of oxygen with the base metal at elevated temperatures to cut the metal. You maintain the necessary temperature by burning a selected fuel gas mixed with pure oxygen. You typically use oxy-fuel cutting on carbon and low alloy steel. For materials from 1/16” (1.6mm) to 4“ (102mm) thick, you typically use manual oxy-fuel gas cutting. For materials 12” (0.3m) and thicker, you should typically use machine cutting. Laser Beam Cutting (LBC) uses the heat from a beam of coherent light, usually with the assistance of a high-pressure gas, to cut metal via highly-localized melting or vaporizing. You’ll also use an assist gas to remove the melted and volatilized materials from the beam path. You can cut both metallic and non-metallic materials with a laser beam process. The most common lasers use carbon dioxide (CO2) and neodymium-doped yttrium aluminum garnet (Nd:YAG). Typically done by mechanized equipment, laser cutting delivers highly reproducible results with narrow kerf-width, a minimal heat-affected zone, and little to no distortion. You need a reliable supply chain of not only gases, but also regulators, specialty equipment and safety products. You want to focus your attention on welding, cutting, brazing and soldering. Let WestAir take the worry out of your gas-related processes and applications. You can count on WestAir to make sure you have the right gases and equipment when and where you need them. Take advantage of our gas experts to help you with the wide range of applications you have at each stage of your processes. You can rely on WestAir for equipment, consumables and safety gear. But that’s not all. WestAir also offers safety training to ensure that all the gases you need are installed and handled properly. And our engineers will guide you through the extensive range of welding and cutting options and gas mixtures available to help you make the process choice best suited to your budget, productivity and quality demands. For more sophisticated processes, you can rest assured that our laser solutions, for instance, are approved by all major laser manufacturers. Metal Fabrication Industires face challenging environmental issues. Most challenges involve prevention of environmental pollution by reducing fumes emission and finding more ways to become more energy efficient. With WestAir, you have acces to a team of experts to help you deal with your environmental issues. Visit our stores in California, Texas & Arizona and try our products.